excellent boat ramp. 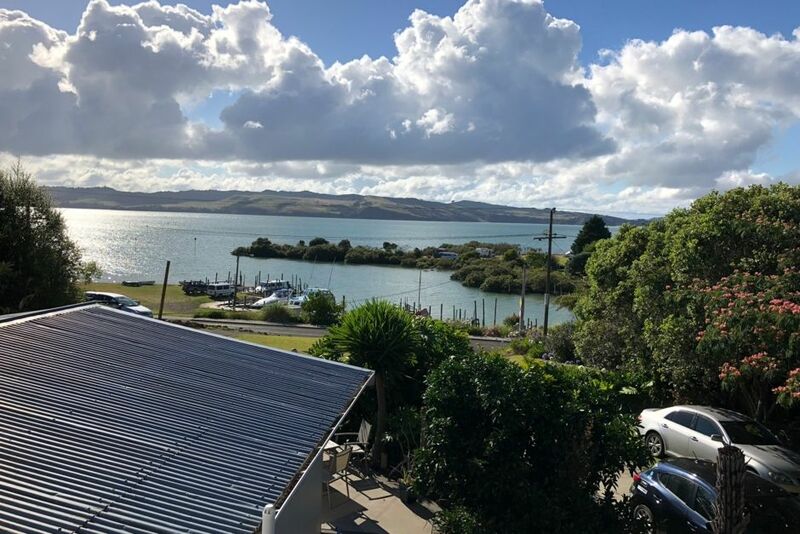 Views over the water from all rooms and a must for the keen fisherman. Enjoy seafood and lovely walks in this sheltered haven only 2hrs north of Auckland. Modern house with great facilities. Unlimited wifi provided. Pantry basics and tea and coffee provided. Only ten minutes drive from the famous Kauri Museum and cafes. Price starts at two people price varies depending on season all extra people are charged per night including children over 5 Maximum 8 people unless arrangements are made. Linen supplied at extra cost neg. Long weekends minimum of 2 nights. House to be cleaned and rubbish removed after stay. Tranquil spot with great views! Very much enjoyed our weekend escape from Auckland. Wonderful views! Very comfortable, quiet and conveniently located house. Thanks, Roxanne! Wonderful sunset and sunrise. Sadly too short, just an overnight moment in time but one to long remember..Very comfortable and relaxing home.Stunning view over the harbour , stimulating drive through the countryside..Staggering display at the Kauri Museum at Matakohe. Lovely place, very welcoming and gas everything you need for your stay. Would definitely recommend.